I posted the tiny house on eBay today. It was challenging figuring out which category it would fit into. I opted for the RV section instead of the trailer section because I figured that’s more the appropriate audience though it has a trailer title. As I was writing out the post, I saw the guidelines said you’d get more bids if you accept financing through their motor financing center. It came with the caveat that not all vehicles would be financed. I contacted customer support to find out whether a tiny house would be considered for financing and after being transferred a couple of times, I found out their financing center is really just a referral service. It will end up with local lenders who will make the final decision. This next weekend is the Austin Home and Garden Show. I’m tentatively planning to park it out front somewhere so that people going to the conference will see it and hopefully check out the eBay auction. The auction is scheduled to end at 3 pm next Sunday the 23rd so I’ll see about parking it nearby the day before. Parking downtown at metered parking is free on the weekend in Austin. But with hundreds of people converging on the conference, I think I’ll need to get there super early to find two adjacent spots (house and truck pulling it). Like I mentioned in the last post, I set the reserve at just over the cost of supplies. If you’ve been in the market for a tiny house, this could be your best opportunity to get one as inexpensively as possible. Click the image above to go to the listing. 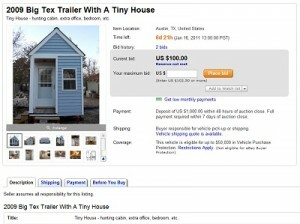 This entry was posted in Announcements and tagged eBay, tiny house for sale. Bookmark the permalink.